The EUR/USD has recovered well from Friday lows, propelling from our 2nd tier downtrend line before fading beneath Wednesday highs. The EUR/USD is now hovering back around its highly psychological 1.50 level as investors continue to dissect news concerning Dubai. Regardless, the currency pair is back in its safe zone following Friday’s scare and the EU econ data wire is relatively quiet until Thursday’s ECB meeting. Although Trichet and the ECB have used more aggressive language in regards to their intent to begin winding down some alternative liquidity measures, there is a bit of uncertainty concerning how the ECB will behave come Thursday due to the incident in Dubai coupled with mixed global econ data. That being said, the ECB did release a Flash CPI today which was one basis point hotter than expected (0.6% vs. 0.5%). Therefore, consumer prices seem to be picking back up with all of the liquidity washing around. The EU will also release German Retail Sales tomorrow along with Germany’s Unemployment Change and the headline EU Unemployment Rate. These data points follow potential market movers in the form of China’s Manufacturing PMI and the RBA’s monetary policy decision. As a result, we could see activity heat up in the next 24 hours. Meanwhile, the Euro’s present relative strength is helping the currency pair hold up strong around its 1.50 level while creating some space between present price and our uptrend lines. Last Wednesday’s surge past October lows was a very bullish move, allowing the EUR/USD to weather the Dubai storm thus far. As a result, both the EUR/GBP and EUR/AUD are performing rather well. However, the EUR/USD may be forced to follow suit should equities and other major Dollar crosses take a turn for the worst. That being said, investors should keep an eye out for our 1st tier uptrend line should it be tested. Our 1st tier runs through November lows. 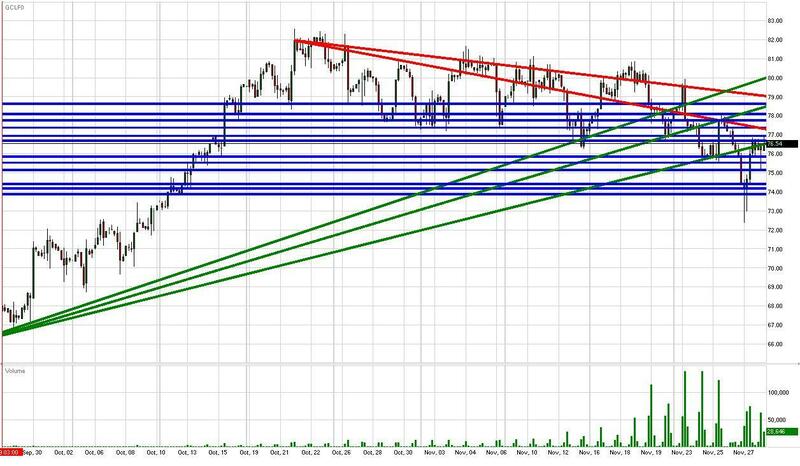 Hence, a movement below the 1st tier may indicate a more protracted pullback towards the 1.460 area. As for the topside, the EUR/USD faces our 3rd tier downtrend line along with previous November highs the psychological 1.50 level. As with the EUR/USD, the GBP/USD recovered well from Friday lows considering the uncertainty surrounding Dubai’s debt situation. Although analysts are still trying to clarify the details of what has occurred, the Cable managed to piece together a solid rally back above our 1st tier uptrend line. However, the GBP/USD is drifting lower again after the bounce topped off at our 2nd tier downtrend line and 10/29 highs. The Pound is still experiencing relative weakness, highlighted by today’s solid performance thus far by the EUR/GBP. The Pound’s weakness stems from both GfK Consumer Confidence and Net Lending to Individuals printing below analyst expectations. Additionally, BoE Governor King’s latest comments regarding the central bank’s present monetary stance were a bit more opaque than what investors were looking for. As a result, the Cable is being dragged lower while investors figure out where to send this market as the Dubai situation unfolds. Meanwhile, the data train will keep on rolling with China’s Manufacturing PMI late Monday EST followed by the RBA’s monetary policy decision. A strong China PMI number coupled with a hawkish stance by the RBA could help turn the Cable and the risk trade around. Britain will release Manufacturing PMI data of its own on Tuesday coupled with Nationwide and HPI numbers. Nationwide was recently a bit cautious concerning its outlook for UK housing prices in 2010, therefore it will be interesting to see how tomorrow’s HPI release turns out. Technically speaking, the Cable’s more critical technical levels seem to be previous November lows along with our 1st tier uptrend line. Hence, the Cable’s pop from Friday lows have helped create some breathing room to the downside. Our 1st tier uptrend line runs through October lows, meaning a failure of our 1st tier could potentially result in a retracement towards the 1.57 area. As for the topside, the Cable faces multiple downtrend lines along with 11/25 highs and the psychological 1.65 level. Hence, there are quite a few near-term topside obstacles, and the immediate-term goal for bulls will likely be continued stabilization with a topside preference. The USD/JPY is consolidating well above Friday lows after tipping over in reaction to the news from Dubai combined with last week’s solid Japanese econ data. Meanwhile, the USD/JPY is fighting to get back above December 2008 lows as U.S. equities and crude turn positive. Japan’s Industrial Production number came in well below analyst expectations, allowing investors to buoy the Yen against the Dollar. Although neither the BoJ nor the Finance Ministry have made any more aggressive comments in regards to an intervention, it seems investors are already pricing in the potential of governmental action considering how close the USD/JPY is getting to its all-time lows. For the time being, we’ll just have to wait and see how investors decide to move forward with the Dubai debt issue in succession with key econ data from China, the U.S. and UK. China will release its Manufacturing PMI data late Monday EST followed by an RBA rate decision. On Tuesday investors will receive HPI and PMI data from the UK followed by America’s own Manufacturing PMI release. Therefore, the FX markets could be in for an active 24 hours. Should the approaching wave of econ data print positively, investors may be willing to wade back into the risk trade while balancing the USD/JPY. However, negative fundamental results could add onto the negative psychological impact from Dubai and unwind the risk trade, sending the USD/JPY lower as a result. Technically speaking, 85 appears to be the new psychological benchmark with 90 hanging far overhead. It’s a bit troublesome to place supports on our chart right now due to limited historical reference. However, we can tell you that the 82.50-85 area proved to be a strong support area during the Spring/Summer of 1995. Therefore, the USD/JPY could experience similar support should the currency pair’s the downturn continue. As for the topside, there are multiple downtrend lines serving as technical barriers as the long-term downtrend bears down on price. Therefore, the USD/JPY will likely need strong support from the bulls to stage a noteworthy rally. Gold has strengthened well from Friday’s selloff, popping back above the psychological $1175/oz level as the EUR/USD and AUD/USD move higher. Investors seeming to be brushing aside the Dubai debt issue, and are reacting by challenging 1100 again in the S&P. Gold is finding comfort in the preference for risk amid an increase in global uncertainty. That being said, there are quite a few key data releases coming from China, the UK, and the U.S. over the next 24 hours which could move the markets. Therefore, gold may be looking to the upcoming fundamental releases before deciding whether to tackle $1200/oz, or submit to recent downside pressure resulting from risk-aversion and profit-taking. Regardless, gold’s impressive uptrend is alive and well with multiple positive technical forces working in its favor. Gold has quite a few uptrend lines in place and the $1150/oz level could prove to be a technical cushion along with 11/27 and 11/17 lows should they be tested. As for the topside, we’re unable to place a downtrend line until we have a bit more track record to use. Therefore, the $1175 and $1200/oz levels serve as technical barriers along with 11/26 highs. For the time being, investors should monitor the EUR/USD’s interaction with our trend lines along with the S&P’s ability to climb back above 1100. A breakout in either could help boost gold due to correlative forces. Crude has popped nicely from Friday lows along with the rest of the risk trade. Markets are recovering quickly from the negative movements resulting from Dubai’s debt issue. The EUR/USD and gold have both returned to respectful levels technically speaking, and the S&P futures are battling with 1100 once again. However, it remains to be seen whether another flash of negative news will hit the wires concerning the impact of Dubai’s money problems. Furthermore, investors will receive key economic data points from China, the UK, and the US along with an RBA Rate Decision in the next 24 hours. That being said, markets could be in for further volatility. Considering crude is negatively correlated with the Dollar and positively correlated with the risk trade, any developments and subsequent broad-based market movements would likely have a noticeable impact on crude. As a result, investors should keep an eye on the EUR/USD’s interaction with 1.50 and the S&P’s behavior near 1100. Technically speaking, although crude continues to trade below our trend lines, the futures have technical cushions in the form of 11/25 and 11/27 lows along with the psychological $75/bbl level. Therefore, it appears as though crude could have a solid support system waiting in the wings. As for the topside, crude faces multiple downtrend lines along with 11/26 highs and the psychological $80/bbl level. The S&P futures are consolidating beneath their highly psychological 1100 level again after recovering nicely from Friday lows. Thus far, it seems that the Dubai debt issue may have been priced into U.S. equities barring another negative shock or side-effect from the matter. However, the situation in Dubai has dented investor confidence, and concern is rising that similar negative developments may occur in other emerging economies. Therefore, the rally we saw taking off on Wednesday has been effectively countered, and the risk trade may need a positive wave of economic data releases and central bank rate decisions this week in order to regain its upward momentum. Speaking of which, China will release its Manufacturing PMI data late Monday EST followed by the RBA’s monetary policy decision. The combination of positive China data and a dovish RBA statement could help mitigate the negative psychological blow dealt by Dubai. However, negative Chinese data coupled with a neutral or cautious RBA could reignite the downturn we witnessed on Friday. In addition to the news events later tonight, the U.S. will release Manufacturing PMI data of its own tomorrow along with the UK’s Manufacturing PMI and HPI data points. Therefore, investors should get a good sense of where manufacturing stands and how the global economic recovery is holding up. Today’s Chicago PMI printed above analyst expectations, setting a positive stage for tomorrow’s release. In addition to America’s Manufacturing PMI number, investors will also receive Pending Home Sales and analysts expect the figure to turn negative by -0.4%. In all, data releases combined with the RBA’s monetary meeting could yield a volatile 24 hours in the markets. Considering investor psychology has been wounded by the Dubai news, additional weight may be placed on upcoming data points. Although last week’s data set was a bit mixed, we saw some very encouraging developments. Most notably, weekly unemployment claims finally fell below the psychological 500k level. Therefore, the U.S. employment market may have taken another big turn for the positive. However, purchases of durable goods were surprisingly weak, indicating consumption remains a sore spot in the U.S. economy. On the other hand, should unemployment continue to improve, consumption may rise as well. Therefore, this week’s upcoming U.S. econ data should help fill out the picture in terms of where unemployment, production, and housing stand at the moment. Technically speaking, the S&P futures face topside barriers in the form of the psychological 1100 level and 11/25 highs. A positive development for the S&P would be to hop back above our 1st tier uptrend line since it runs through previous November lows, or the 1025 area. As for the downside, the S&P has 10/22 and 11/27 lows serving as technical cushions along with the psychological 1075 and 1050 levels.